China?s unique first corner nearly completes a full 360 degrees before looping back on itself. Cunning drivers have used this to their advantage by running around the outside of their rivals to gain places ? but sometimes that strategy has ended in tears. The even more radical ?set off before the lights change? approach is only successful up to a point, as Fernando Alonso discovered in 2010. 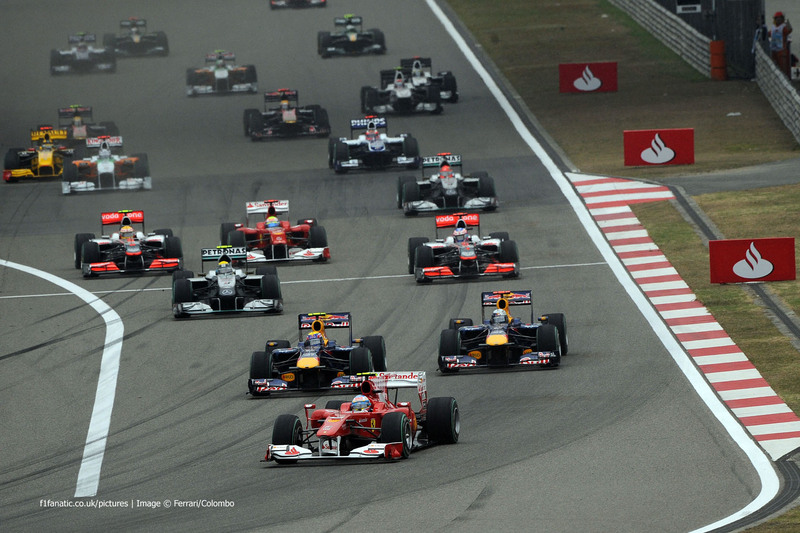 When China first appeared on the F1 calendar in 2004 the grand prix was held near the end of the season. The inaugural Shanghai race was the 16th round of 18, but both championships had been won a month earlier in a season dominated by Ferrari. The new track caught newly-crowned seven-times champion Michael Schumacher out in qualifying, however, and he started from the pits after spinning. That left the other Ferrari of Rubens Barrichello to take a straightforward victory from pole position. 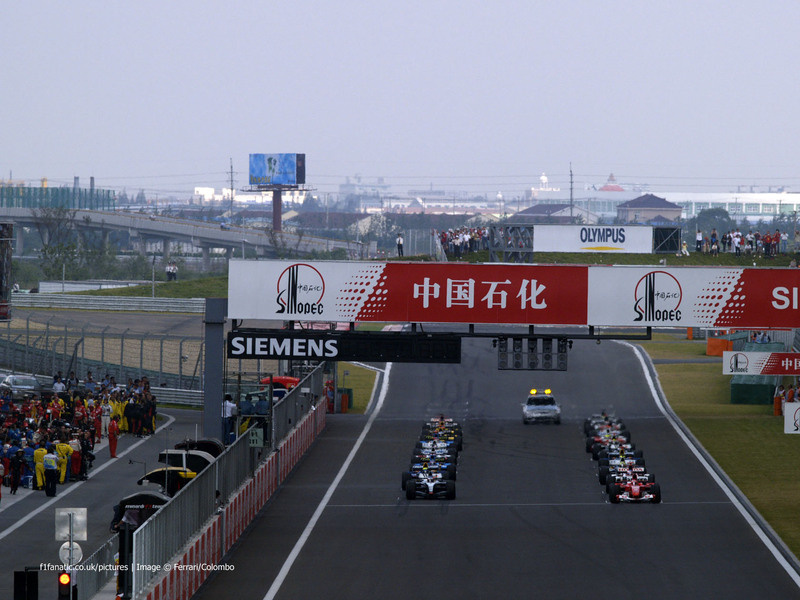 The following year the Shanghai circuit brought the curtain down on the season. Again the drivers? title had already been won ? by Fernando Alonso ? and in the final race front row occupants Renault sealed the teams? title. They were chased hard by McLaren, but the silver team?s chances were derailed when a loose drain cover (not the first such problem on the $325 million circuit) damaged Juan Pablo Montoya?s car. 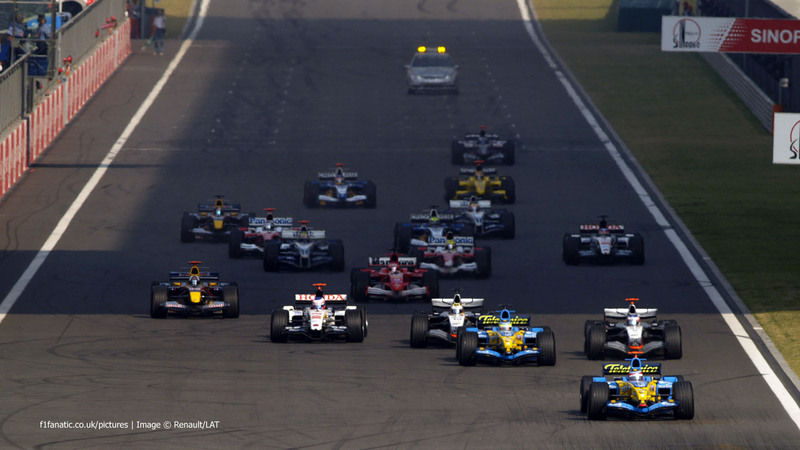 It was a front row lock-out for Renault again in 2006, but they did not get the result they wanted in the race. 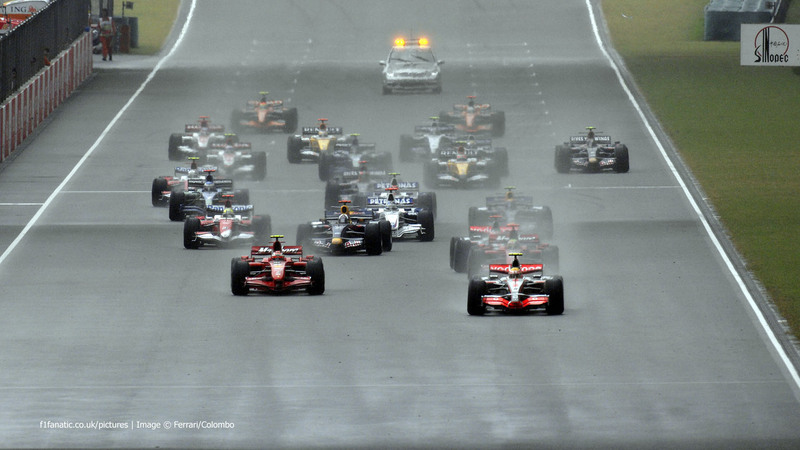 Alonso made a great start on a slippery track but Schumacher, sixth on the grid, closed in when conditions dried later in the race. The Ferrari driver jumped ahead to take his 91st and final victory, which also tied him with Alonso at the top of the points table with two races remaining. The star of the start was Kimi Raikkonen, who went around the outside of Rubens Barrichello at turn one and briefly passed the other Honda of Jenson Button too. 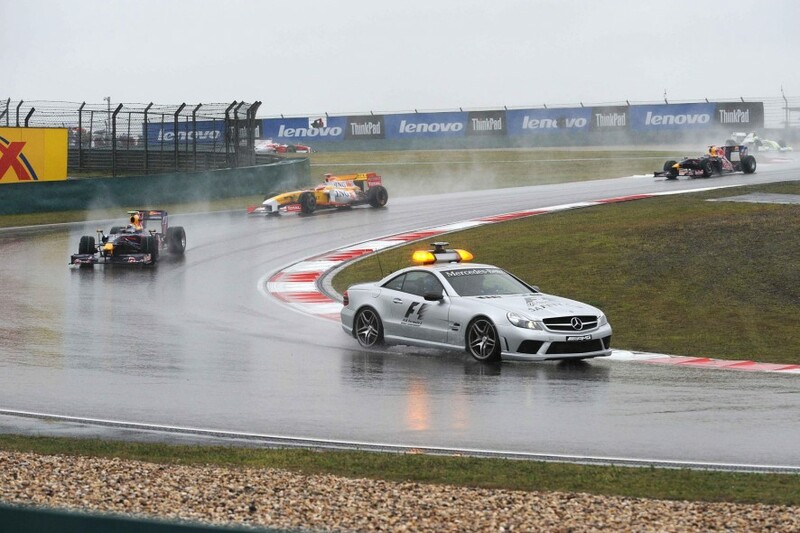 Wet conditions again in 2007, and when Lewis Hamilton streaked away from pole position he seemed on course to clinch the world championship in his rookie season. A pit-lane slip-up put paid to those hopes, however. Alonso went around the outside of Massa at turn one but lost the position a few corners later. Ralf Schumacher, who started sixth, was left pointing the wrong way. Shanghai was a happier place for Hamilton the following year as a crushing win put him on course to wrap up the title at the season finale. While he left the Ferraris behind on the first lap team mate Heikki Kovalainen struggled in vain to contain Alonso?s Renault, and a first corner tangle saw Jarno Trulli and Sebastien Bourdais spin out. 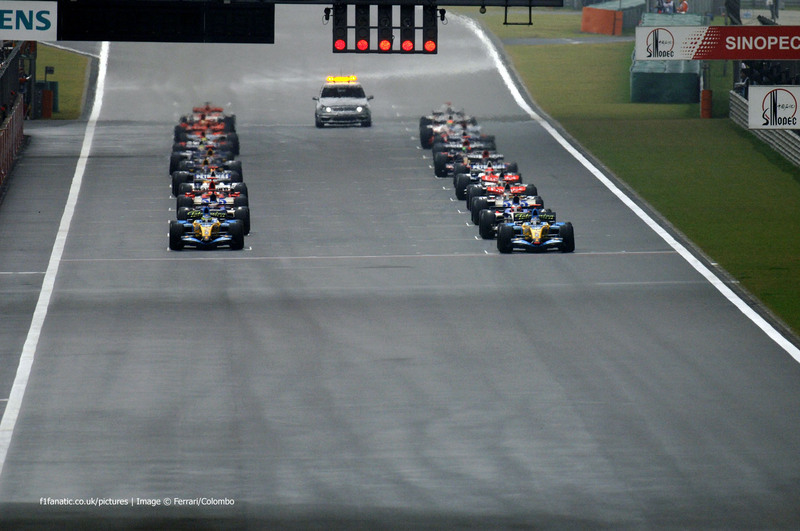 China?s round of the world championship moved to the beginning of the season in 2009, and on a drenched track the race started behind the Safety Car. Sebastian Vettel led Alonso to turn one, but the Renault driver was light on fuel at the start which ultimately allowed Mark Webber into second place to complete Red Bull?s first of many one-twos. Alonso beat the Red Bulls to turn one in 2010 ? but not legitimately. The Ferrari driver had jumped the start, and a penalty dropped him back into the pack. When the cars reached turn four Vitantonio Liuzzi lost control of his Force India under braking and took himself out of the race along with Kamui Kobayashi and Sebastien Buemi. Nico Rosberg and Jenson Button ? fourth and fifth at turn one ? made an astute gamble by staying out of the pits when rain began to fall a few minutes after the start, and Button later passed the Mercedes to win. Vettel?s pole position advantage proved short-lived in 2011: despite a to-the-letter-of-the-law tough defence, both McLaren drivers beat him to turn one. Hamilton took the win while Webber ? not visible in the picture above because he started on the ninth row ? recovered to third. It was an all-Mercedes front row in 2012 for Rosberg and Michael Schumacher. They kept their places at the start but Kobayashi, who lined up third, was passed on either side by Button and Raikkonen. 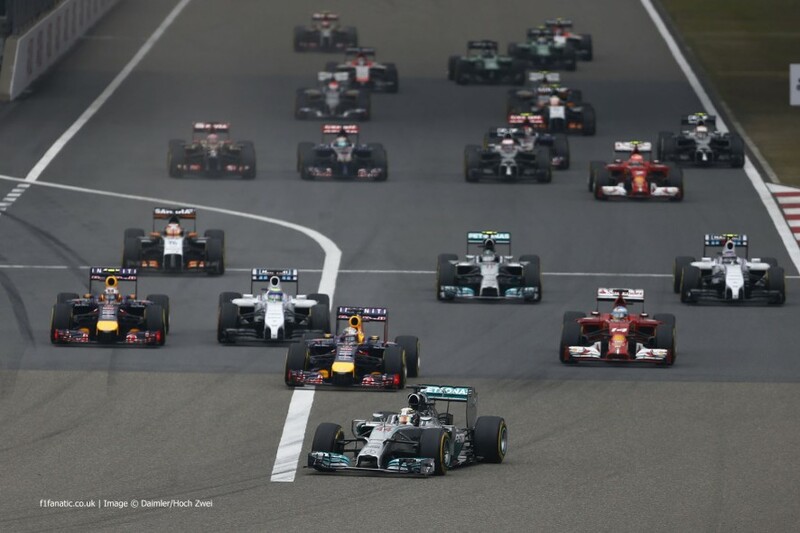 Rosberg went on to claim his first win while the Red Bulls of Webber and Vettel, largely obscured in the picture above, climbed to fourth and fifth. 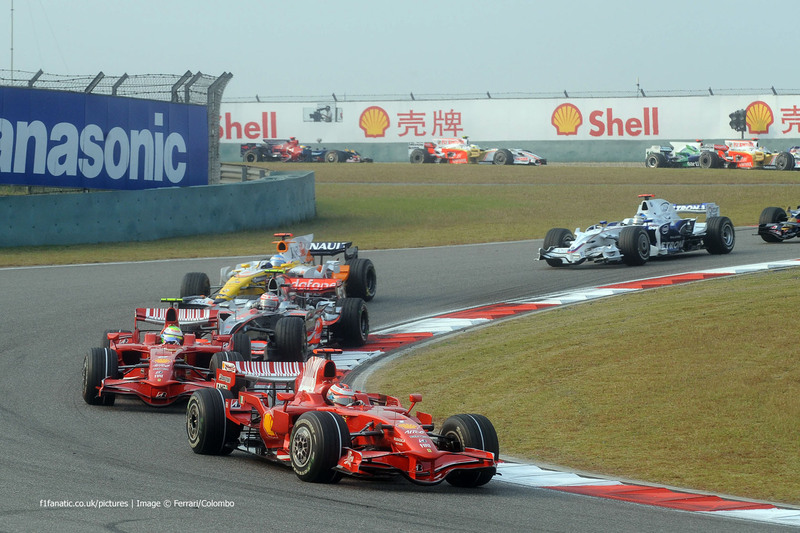 A slow start from the front row by Raikkonen left Hamilton unopposed on the run to turn one in 2013. The Ferraris followed him and a few laps later overtook the Mercedes, Alonso going on to take the win. The two Williams drivers were fortunate to make it through turn one unscathed last year. Massa made a lightning start from sixth but banged wheels with Alonso and slipped back. Then Valtteri Bottas made contact with Rosberg, who got away slowly following a telemetry problem. The latter recovered to finish second behind Hamilton. How do kids like Dad: Smooth-shaven or tickly with beard? How seriously should you treat your blog stats?